Daphne and its development during 15th century is a riddle inside the Trionfi card development. She appears as a central card in the Michelino deck. In these days we discussed, if the tercet 4 of the Boiardo Tarocchi poem addressed Laura, the muse of Petrarca, or if it simply addressed Daphne which changed in a laurel tree. Occhio da la virtù né il piè in traverso. Her eye from virtue nor ever put a foot wrong. Daphne (/'dæfni?/; Greek: ??f? ?, meaning "laurel") is a minor figure in Greek mythology known as a naiad—a type of female nymph associated with fountains, wells, springs, streams, brooks and other bodies of freshwater. There are several versions of the myth, but the general narrative is that because of her beauty, Daphne attracted the attention and ardor of the god Apollo (Phoebus). Apollo pursued her and just before being overtaken, Daphne pleaded to her father, the rivergod Ladon, and Ge (Gaia) for help. So Ladon then transformed Daphne into a laurel tree. In Metamorphoses by Roman poet Ovid, she is identified as the daughter of the rivergod Pineios in Thessaly. At the Pythian Games which were held every four years in Delphi in honour of Apollo, a wreath of laurel gathered from the Vale of Tempe in Thessaly was given as a prize. According to Pausanias the reason for this "simply and solely because the prevailing tradition has it that Apollo fell in love with the daughter of Ladon (Daphne)". Ladon (also a river god and also a river) as father of Daphne is part of an Arcadian variant to the Ovid story. Pausanias made a description of Greece, in which he writes long passages about the river Ladon. Pausanias mentions a river Peneus at the Peloponnese (not that of Thessaly), and this a small tributary called Ladon in the time of Pausanias. However, this river Ladon is not the other more famous Ladon, which feeds the river Alpheus. One should know, that there are 5 different rivers with the name Asopus, it seems to have been rather common in Greece to use the same name for different rivers. 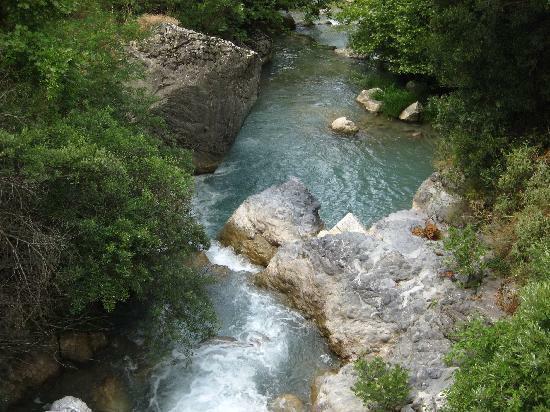 The river Peneus or Pinios (Peloponnese) has about 70 km, the river Peneus (Thessaly) I saw given with 184 or 216 km. The Ladon rises on the western slope of the Aroania mountain, near the village Kastriá, Lefkasi municipal unit, Achaea. It flows south, receives its left tributary Aroanios, flows along Kleitoria and turns southwest near the Arcadian border. It flows through the artificial Ladon Lake, and turns south again near Dimitra. 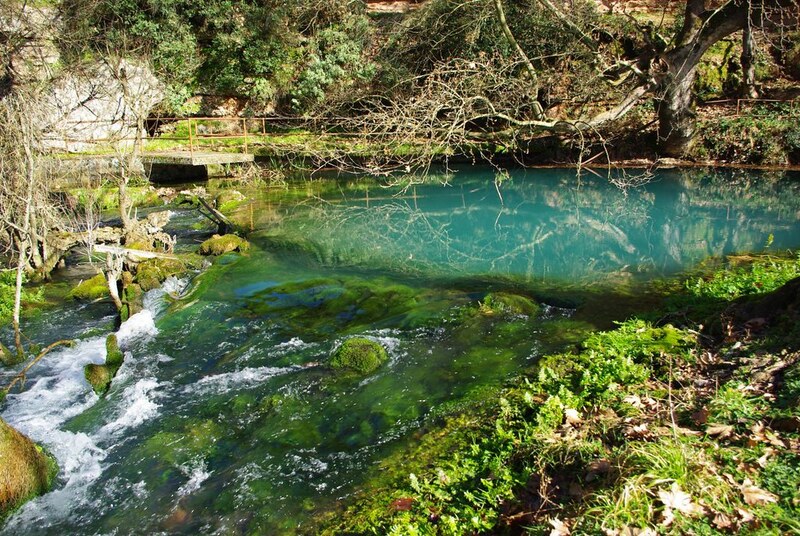 It flows into the Alfeios 3 km southeast of the village Tripotamia. Rivers have cleansing effect in Greek mythology. When Poseidon assaulted Demeter, she washed away the insult in the waters of the River Ladon. The comment to Demeter and Poseidon gives reason to think about. Poseidon raped his sister Demeter and the result were Arion (a horse) and Despoina (a woman with a horsehead, some suspect, that she was identical to Persephone; possibly there is a relation to Epona, a far spread celtic horse-goddess). Demeter didn't like that. For Daphne, connected to the same river Ladon it might mean, that she had experienced a negative male sexual approach and had so some reason to avoid Apollo (in the understanding of the responsible myth-creator). Demeter and Poseidon's names are linked in the earliest scratched notes in Linear B found at Mycenaean Pylos, where they appear as and in the context of sacralized lot-casting. In the myths of isolated Arcadia in southern Greece, Despoina (Persephone), is daughter of Demeter and Poseidon Hippios, Horse-Poseidon. These myths seem to be connected with the first Greek-speaking people who came from the north during the Bronze age. Poseidon represents the river spirit of the underworld and he appears as a horse as it often happens in northern-European folklore. He pursues the mare-Demeter and she bears one daughter who obviously originally had the form or the shape of a mare too. Demeter and Despoina were closely connected with springs and animals, related to Poseidon as a God of waters and especially with the mistress of the animals Artemis, the goddess of Nymphs. Demeter as mare-goddess was pursued by Poseidon, and hid from him among the horses of King Onkios, but could not conceal her divinity. In the form of a stallion, Poseidon caught and covered her. Demeter was furious (erinys) at Poseidon's assault; in this furious form, she is known as Demeter Erinys. But she washed away her anger in the River Ladon, becoming Demeter Lousia, the "bathed Demeter". "In her alliance with Poseidon," Karl Kerenyi noted, "she was Earth, who bears plants and beasts, and could therefore assume the shape of an ear of grain or a mare." She bore a daughter Despoina (??sp?? ?a: the "Mistress"), whose name should not be uttered outside the Arcadian Mysteries, and a horse named Arion, with a black mane and tail. In Greek mythology, Oncius or Oncus was a son of Apollo and a ruler over Oncium (Onkeion), a region of Arcadia adjacent to Thelpusa, as well as eponym of a city Oncae. He owned a herd of horses, in which Demeter tried to hide from Poseidon's advances, changing herself into a mare. Poseidon did mate with her in the shape of a stallion, which resulted in the birth of the fantastic horse Arion. Oncius kept Arion and later gave him away to Heracles as the latter was starting a military campaign against Elis. Onkios was a Apollo son, so he had a natural relation to Delphi. His place was located at the river Ladon. [*]Hercules used Arion in fights against the kingdom of Elis (after his 12 works) and after he conquered it, he founded the Olympic games. [*]The latter had the consequence, that other games at other places were introduced. [*]Hercules had before (5th work) cleaned the stables of Augeias. According to Pausanias, Heracles, waging war with the Eleans, acquired this horse from Oncus. The son of Zeus would have thus ridden upon Arion when he seized Elis. Thereafter, Heracles gave Arion to Adrastus; this is why Antimachus said of Arion: "Adrastus was the third lord who tamed him." Adrastus was then active with the games of Nemea. He founded them. Thelpusa was ruined by war fights, possibly the reason, why the Daphne/cult searched for a new place for veneration and a new river father. But the original name was "Onkeion", perhaps the new name Thelpusa (first noted in 4th century BC) indicates another important change. The riddle hasn't found its end. thanks, the server promotes error these days, acting, as if it hadn't gotten the "submit"-signal, but has it done. The project is "still in work", the pictures will follow. There was always trouble with Theben. 16 kings are counted for the various mythological rulers. ... and Zethos had a son of Thebe and the city of Theben got the name Theben cause of Thebe (there are competing versions ... according one a wife named Aedon killed her own son Itylos, when she attempted to kill Amphion's oldest son). Zethos killed himself after the loss of his son, Amphion lost his life, when he attacked a temple of Apollo in revenge. Laius, very young, had escaped to the court of Pelops at Pisa on the Peloponnese. Pelops was connected to horse-chariot racing before, cause he had king Oenomaus beaten in a chariot race and so he won the hand of Hippodamia (hippo- means horse), from whom he got many children. Pelops did win with the help of Myrtilus (a son of Hermes), the charioteer of Oenomaus, but didn't pay him (Myrtilus wanted Hippodamia) and threw him from a cliff in the ocean. Myrtylus cursed Pelops and this caused a lot of cruel stories. After his victory, Pelops organized chariot races as thanksgiving to the gods and as funeral games in honor of King Oinomaos, in order to be purified of his death. It was from this funeral race held at Olympia that the beginnings of the Games were inspired. Pelops became a great king, a local hero, and gave his name to the Peloponnese. One of cruel stories was, that Laius abducted and raped Chrysippus, a son of Pelops outside of marriage. Laius taught Chrysippus chariot-racing, and promised Chrysippus, that he could participate at the games of Nemea. Laius became king at Theben and married Iocaste. A son Oedipus got a bad oracle and was left in the wilderness in the expectation of death, but he survived. Oedipus: King Polybus of Korinth/Sikyon raised Oedipus as his adopted son. Oedipus got the oracle, that he would kill his father and Oedipus thought, that this would mean Polybus, so Oedipus avoided to go back home, and went to Theben instead. He killed Laius, when Laius drove on a chariot, but Oedipus didn't know, that this was his father. He solved the riddle of the Sphinx and married his mother Iokaste, from which he got 2 sons (Eteocles & Polynices) and (Antigone and Ismene). Finally the true background became obvious and Oedipus retired. "Oedipus desired to stay in Thebes but was expelled by Creon." "... argued over the throne, but Eteocles gained the support of the Thebans and expelled Polynices, who went to Oedipus to ask for his blessing to retake the city, but instead was cursed to die by his brother's hand." Or "In Hellanicus's account, Eteocles offers his brother his choice of either the rule of the city or a share of the property. In Pherecydes, however, Eteocles expels Polynices by force, and keeps the rule of Thebes and the inheritance. The Bibliotheca and Diodorus state that the brothers agree to divide the kingship between them, switching each year. Eteocles, however, was allotted the first year, and refused to surrender the crown." Polynikes appeared in Argos ... and horse Arion arrives our theme (again): Adrastus, who had gotten Arion, the immortal horse, from Hercules, had received a kingdom in Sikyon first and later also in Argos. During a feud between the most powerful houses in Argos, Talaus was slain by Amphiaraus, and Adrastus being expelled from his dominions fled to Polybus, then king of Sicyon. When Polybus [the king, who took the lost child Oidipus as a son] died without heirs, Adrastus succeeded him on the throne of Sicyon, and during his reign he is said to have instituted the Nemean Games. Afterwards, however, Adrastus became reconciled to Amphiaraus, gave him his sister Eriphyle in marriage, and returned to his kingdom of Argos upon the swift immortal horse Arion, a gift of Heracles. During the time he reigned there it happened that Tydeus of Calydon and Polynices of Thebes, both fugitives from their native countries, met at Argos near the palace of Adrastus, and came to words and from words to blows. On hearing the noise, Adrastus hastened to them and separated the combatants, in whom he immediately recognised the two men that had been promised to him by an oracle as the future husbands of two of his daughters, for one bore on his shield the figure of a boar, and the other that of a lion, and the oracle was that one of his daughters was to marry a boar and the other a lion. Adrastus, therefore, gave his daughter Deipyle to Tydeus, and Argeia to Polynices, and at the same time promised to lead each of these princes back to his own country. Adrastus now prepared for war against Thebes, although Amphiaraus foretold that all who should engage in it should perish, with the exception of Adrastus. Thus arose the celebrated war of the Seven against Thebes, in which Adrastus was joined by six other heroes, Polynices, Tydeus, Amphiaraus, Capaneus, Hippomedon, and Parthenopaeus. Instead of Tydeus and Polynices other legends mention Eteoclos and Mecisteus. This war ended as unfortunately as Amphiaraus had predicted, and Adrastus alone was saved by the swiftness of his horse Arion. After the battle, Creon, king of Thebes, ordered that none of the fallen enemies were to be given funeral rites. Against his order, Antigone buried Polynices and was put to death, but Adrastus escaped to Athens to petition Theseus, the city's king, to attack Thebes and force the return of the bodies of the remaining five. Theseus initially refused but was convinced by his mother, Aethra, who had been beseeched by the mothers of the fallen, to put the matter to a vote of the citizens. The Athenians marched on Thebes and conquered the city but inflicted no additional damage, taking only what they came for, the five bodies. They were laid upon a funeral pyre and Adrastus eulogized each. "son of Eteocles, inherited Thebes from his father. In one version of the myth (different from the one recounted in Sophocles' Antigone), he was responsible for the deaths of his aunts Antigone and Ismene, whom he prosecuted for having buried Polynices. They sought refuge in the temple of Hera, but Laodamas set fire to it and thus killed them. During the battle of the Epigoni, he was killed by Alcmaeon after he killed Aegialeus. Other sources state that he survived and fled to the Encheleans in Illyria, and subsequently led an expedition to Thessaly." "In Homer's Iliad, Thersander was one of the Epigoni, who attacked the city of Thebes in retaliation for the deaths of their fathers, the Seven Against Thebes, who had attempted the same thing. He was the son of Polynices and Argea. Thersander may have bribed Eriphyle with the robe of Harmonia so that she sent her son, Alcmaeon, to fight with him. His father did the same with Harmonia's necklace to convince her to send her husband with the original attackers. The attack of the Epigoni was successful, and Thersander became the king of Thebes. Thersander intended to fight for the Greeks during the Trojan War, but was killed by Telephus before the war began, while the Greeks had mistakenly stopped in Mysia. He was succeeded by his son Tisamenus, whose mother was Demonassa. Pindar refers to Thersander as gaining honor after Polynices' death and preserving the house of Adrastus for later generations." Well, I made red text in this list to points, about which I'll argue later. Actually the interest is still in Daphne, and in her father Ladon and in the Apollo-city at the Ladon and the horse Arion, which was born there and chariot-racing at panhellenic games. The page speaks of 4 inhabitants today. The location has the value 200 meters above sea level. Ladon is variously mentioned as father of Daphne, in contrast to the solution of Ovid, who used another river god and this river is relative far in the north in Thessaly, not on the Peloponnese. The 22 children of Metope, Ladon's daughter, are noted. Thelpusa is also called a daughter of Ladon. In classical mythology, Syrinx /ˈsɪrɪŋks/ (Greek Σύριγξ) was a nymph and a follower of Artemis, known for her chastity. Pursued by the amorous Greek god Pan, she ran to a river's edge and asked for assistance from the river nymphs. In answer, she was transformed into hollow water reeds that made a haunting sound when the god's frustrated breath blew across them. Pan cut the reeds to fashion the first set of pan pipes, which were thenceforth known as syrinx. The word syringe was derived from this word. However, it is very difficult to read sometimes, even if you're born with German language. I translate only the green and blue passages, as these include new information. "Die Daphne erzeugte er (Ladon) mit der Erde" means that Ladon paired with "Earth" and the result was Daphne. It's not clear, who is earth now in this mythology snippet: Gaia, Rhea and Demeter might be possible candidates, which would mean, that Ladon had either a rank between Uranos or Pontos (for the solution "Gaia" or a rank between Zeus and Kronos (for the solution Rhea) or a rank like Poseidon (for the solution Demeter). The last of these stories (Ladon = Poseidon / Demeter) looks probable, as the case, which happened in Thelpusa near the river Ladon, involved Demeter and Poseidon. I can't solve riddle of the references (at least for the moment; this is the case with most references). "Vater der Nymphe Thelpusa" means Ladon is the father of the nymph Thelpusa (we already had that). An alternative genealogy calls him son of Echeos of Tegea and of Timandra, daughter of Tyndareos and Leda. And we have a further of Ladon daughter, joining Daphne, which opened the series of Trionfi decks, Thelpusa (perhaps just a lost settlement, birthplace of a speaking horse Arion), Merope and her 14 or 22 children and now a sybil Carmenta-Themis-Nicostrate-Tyburtis and mother of culture-hero, who transported even alphabets. Isn't that a strange composition in a Tarot history forum? "Über den Zusammenhang dieses Flusses mit dem Drachen Ladon, siehe ..." means that there is some literature about between the river god Ladon and the dragon Ladon, as it appears in the 10th work of Hercules in the Atleas-scene at the garden of the Hesperides. Hercules shoots the dragon. Well, that's the question, which interests me. A German travel report of the year 1822 ..
... speaks of the start of the river Ladon, which is reported to be there already a strong river ("reißender Fluß"), meaning, that the water runs under the surface a longer distance. The author gives some locations, but I was not able to verify this observation. Google maps stays weak in this question. A similar analysis (as the travel report) gives the report (1852) at ..
... which gives also the interesting information, that the Ladon has (or had) more water than the Alpheus (nonetheless its seen as the tributary river). In mythology texts I saw, that the wife of the river god Ladon is given as Stymphalis, indicating a context (by the underground streams) from the lake at the city of Stymphfalia to the river Ladon ..
... and Stmphalia was the place of the 6th work of Hercules against dangerous birds at the lake. The lake itself was dangerous in old times, cause the underground streams of water, which emptied the water to rivers, occasionally were blocked, and the result were water catastrophes around the lake. "They [the Argonauts] found the sacred plot where, till the day before, the serpent Ladon, a son of the Libyan soil, had kept watch over the golden apples in the Garden of Atlas, while close at hand and busy at their tasks the Hesperides sang their lovely song. But now the snake, struck down by Herakles, lay by the trunk of the apple-tree. Only the tip of his tail was still twitching; from the head down, his dark spine showed not a sign of life. His blood had been poisoned by arrows steeped in the gall of the Lernaian Hydra, and flies perished in the festering wounds . . .
[The Hesperis Aigle (Hesperid Aegle) addresses the Argonauts :] ‘There was a man here yesterday, an evil man, who killed the watching snake, stole our golden apples, and is gone. To us he brought unspeakable sorrow . . . [he carried] the bow and arrows with which he shot our monster here.’"
... and this text of Stoll I could identify and it is wonderful and confirms my own suspicions to Ladon to a big part. I need some time to study it myself. Well, for the moment the short information, that there was a 3rd river Ladon (beside the big Ladon at the Peloponnese and the smaller Ladon also at the Peloponnese, but feeding the Pelopponese Peneios instead the Alpheios) and this 3rd Ladon was very close to the place, where the founder of Theben Kadmos killed his dragon. One has to remember, that Apollo killed the dragon Pythia or Delphine and founded Delphi as a major place for oracles. Theben - where Kadmos killed his dragon - became the living place of the truth-saying Teiresias. Thelpusa at the river Ladon also had its truth-saying function with the Ladon daughter, which went to Italy with her son Euander, and with the Apollo-son Onkios. 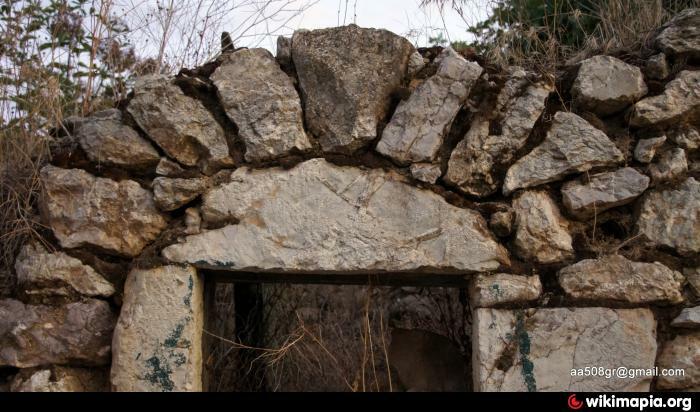 In Theben Kadmos manifested an Athena-Onka temple close to the dragon place. Onka-Onkios. And the dragon in the Iason-Argonautica event far away in Kolchis shall have come also from Theben. Lotan is brought together with "Leviathan". It seems, that a Phoenician dragon name invaded with Kadmus the Greek river names. Could you please clarify the question that interests you for me Huck? I got from your above studies here that you are interested in the genealogy of heroes & heroines & gods (or personified forces of nature - e. g. the river/dragon Ladon? ). Ein mythologisch fester Stammbaum der griechischen Götter und Helden besteht nicht und bestand nie. Unfortunately the English version of that Wikipedia page is not sufficient. For better reading results the original link above might be clicked if you do not want to save it. As the title says, I'm interested in the Daphne riddle. Ovid has it, that Daphne was the daughter of the river Peneus in Thessaly. Others say, that Ladon was the father. So there's a contradiction. I persecute (for the moment) the Ladon version. This leads to the question, if Ladon the river god has some connection to Ladon the dragon, as it appears in the 10th work of Hercules. Thanks for the clarification Huck. So I misunderstood what I did read. Since I had no time yet to read through your new post above I'll come back later for that. Some ideas come late. So let the Stoll information sleep a little bit. In Greek mythology, Styx (/stɪks/; Ancient Greek: Στύξ [stýkʰs]) is a deity and a river that forms the boundary between Earth and the Underworld (the domain often called Hades, which also is the name of its ruler). The rivers Styx, Phlegethon, Acheron, Lethe, and Cocytus all converge at the center of the underworld on a great marsh, which sometimes is also called the Styx. According to Herodotus, the river Styx originates near Feneos. I don't know much about these rivers Phlegethon, Acheron, Lethe, and Cocytus, they never got my attention. Perhaps I should look out for them later. A great marsh (Styx) in the center of the other 4 rivers would make sense. The river Styx originates near Feneos, so says Herodot (that was, what I searched). Somehow this makes sense: the Ladon is assumed to be also fed by water from the Pheneos (= Feneos). Well, Ladon's wife is called "Stymphalis" and this starts like Sty-x. Styx married Pallas, one of the 3 sons of Krios, a Titan and son of Uranos (heaven) and Gaia (earth). Krios had married Eurybia, a daughter of Pontus (ocean) and Gaia (earth). 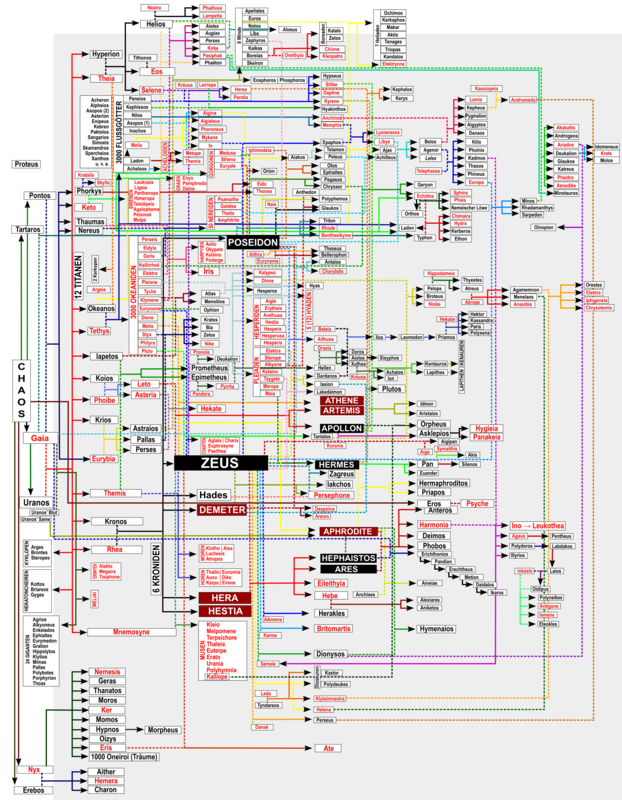 This was a single connection between the both different family trees, as most male Titans married a direct sister and the remaining Titan Iapetos married "Asia", so something like "everything which comes from the East". The question for the place, where Hades abducted Persephone, has many answers, but the highest local probability has the Arcadian Feneos (or Pheneus). The other places are not at the Peloponnese. I found this map of the Peloponnese rivers. According this the river Ladonas reaches far south and runs through the city Vytinia (nowadays Vitina). ... so possibly a river, which occasionally disappears. From all this one may conclude, that "somehow" the river Ladon was a "hidden husband" to Sty-x (= Stymphalis), somehow in the mask of Pallas, son of the Titan Krios. Carmenta-Themis-Nicostrate-Tyburtis, a woman with 4 names, a sybil composition, mother by god Hermes to Euandros, a "good-man", who was so friendly to found the big Rome ... not yet, but nearly. At the hill Palatin, the name "Palatin" cause he came from Pallation, nowadays Pallatio, a small location in Arcadia. Well, a grandson of Pallos=Ladon. The normal Titan-son Pallas had also 4 children from Styx: one is well known, that's Nike, mother of the Trionfi cards, cause she means "triumph" or "victory", and the others are less known, Zelos (meaning dedication, emulation, eager rivalry, envy, jealousy, and zeal), Kratos (meaning strength, might, power and sovereign rule) and Bia (female as Nike, meaning force, power, might, bodily strength and compulsion). All are winged like "Fame" on the Minchiate. Styx had naturally the same sons and daughters, but also 4 rivers around her, which somehow remembers the 4 rivers of paradise: "Genesis 2:10–14 lists four rivers in association with the garden of Eden: Pishon, Gihon, the Tigris, and the Euphrates". Well, there is a viper in paradise and also a tree with apples, as there is a viper in the garden of the Hesperides and also a tree with apples, and the viper in the latter case has a name, and the name is: Ladon, rather similar to "Lôtān, Litan, or Litānu (Ugaritic: Ltn, lit. "Coiled") was a sea monster in Canaanite mythology, similar to as Leviathan in Hebrew mythology." Eurynome was alone ... she danced on the water, and the dance created some wind, and the viper Ophion came from it. Together they produced a little bit the world, as we know it, finally Eurynome had enough of Ophion and kicked him, Ophion lost a few teeth (important detail) and had to live in dark caves since then. Graves's retellings have been widely praised as imaginative and poetic, but the scholarship behind his hypotheses and conclusions is sometimes criticised as idiosyncratic and untenable. Ted Hughes and other poets have found the system of The White Goddess congenial; The Greek Myths contains about a quarter of that system, and does not include the method of composing poems. The Greek Myths has been heavily criticised both during and after the lifetime of the author. Critics have deprecated Graves's personal interpretations, which are, in the words of one of them, "either the greatest single contribution that has ever been made to the interpretation of Greek myth or else a farrago of cranky nonsense; I fear that it would be impossible to find any classical scholar who would agree with the former diagnosis". Graves's etymologies have been questioned, and his largely intuitive division between "true myth" and other sorts of story has been viewed as arbitrary, taking myths out of the context in which we now find them. The basic assumption that explaining mythology requires any "general hypothesis", whether Graves's or some other, has also been disputed. The work was called a compendium of misinterpretations. Robin Hard called it "comprehensive and attractively written," but added that "the interpretive notes are of value only as a guide to the author's personal mythology". Michael W. Pharand, quoting some of the earlier criticisms, rebutted them: "Graves's theories and conclusions, outlandish as they seemed to his contemporaries (or may appear to us), were the result of careful observation." H. J. Rose, agreeing with several of the above critics, questions the scholarship of the retellings. Graves presents The Greek Myths as an updating of William Smith's Dictionary of Greek and Roman Biography and Mythology (originally published 1844) and calls it still "the standard work in English", never brought up to date: Rose is dismayed to find no sign that Graves had heard of the Oxford Classical Dictionary or any of the "various compendia of mythology, written in, or translated into, our tongue since 1844". Rose finds many omissions and some clear errors, most seriously Graves's ascribing to Sophocles the argument of his Ajax (Graves §168.4); this evaluation has been repeated by other critics since.